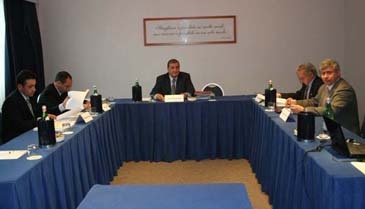 A meeting of the 3rd WTF Sanction Committee is under way at the Holiday Inn Hotel in Rome, Italy, on April 8, 2008. The ad-hoc Sanction Committee is headed by Gen. Ahmed Fouly of Egypt, a vice president of the WTF. The World Taekwondo Federation held the 3rd Sanction Committee Meeting at the Holiday Inn Eur Parco del Medici in Rome, Italy, on April 8, 2008. The ad-hoc Sanction Committee, headed by Egypt's Gen. Ahmed Fouly, dealt with two separate disciplinary cases involving a WTF vice president and a WTF staff. The Sanction Committee decided to resume the meeting on April 9 at the Sheraton Golf Parco de' Medici Hotel to produce its final meeting results. The Sanction Committee chairman is expected to deliver the meeting final results to WTF President Chungwon Choue via email, and hand the envelop containing the meeting results to a WTF staff on the scene. The WTF will announce the results shortly. The 3rd Sanction Committee meeting came about one month after the 2nd Sanction Committee meeting on March 3, 2008 in Seoul, Korea. The WTF held its 1st Sanction Committee meeting on Feb. 29, 2008 in Beijing, China. On March 7, the WTF announced the termination of the employment of two of its staff members, in accordance with the decisions of the WTF's Sanction Committee. On the day, the WTF informed the two WTF staff of their termination of employment for their negligence of duties and bringing disgrace to the WTF, in accordance with the final decisions of the WTF's ad-hoc Sanction Committee. The Investigation Committee was formed at the recommendation of the Joint Meeting of the WTF Continental Union Presidents and Secretaries General held in Seoul on Jan. 10, 2008 and the approval of the WTF's Executive Committee meeting on Jan. 11, 2008. The Joint Meeting of WTF Continental Unions called for the immediate formation of an ad-hoc Investigation Committee to conduct a thorough probe of a series of rumors and allegations levied against the WTF leadership over the last several months, as well as wrongdoings and negligence of duties of several WTF staff.